Here at ChartSmarter I have become very focused with my work, and the last few months have been doing a daily report on a specific sector. Today I am going to be even more concentrated, and fixate on an individual country. Below we will look at two stocks that have made fine moves as of late. 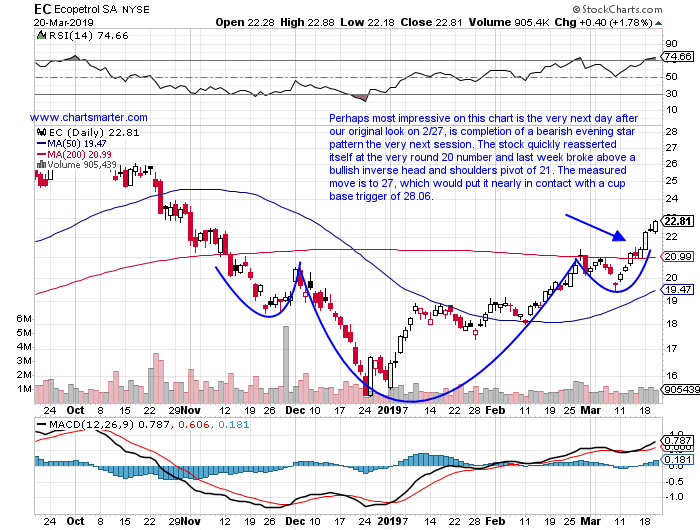 First is Ecopetrol, and directly below is the chart and how we looked at the name in our 2/28 Energy Report. Integrated Colombian energy play higher by 33% YTD and 15% over last one year period. Dividend yield of 3.1%. Higher 6 of last 8 weeks and good relative strength this week up 6.1% thus far after earnings. Still trying to work off nasty 45.5% decline during 9 of 13 week losing streak weeks ending between 10/5-12/28/18. 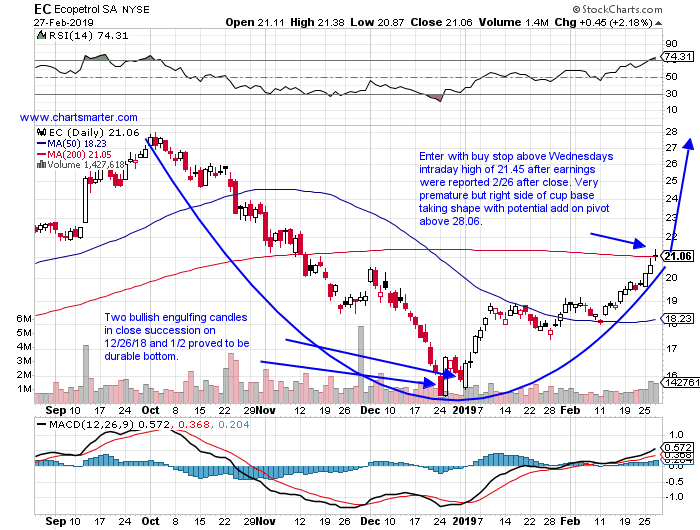 Enter with buy stop above 200 day SMA at 21.45. Add to through cup base pivot of 28.06. Entry EC 21.45. Stop 19.75. Fast forward to today and we see the name is now 8.3% above the recommended pivot. Excellent relative strength this week higher by 6.7%, and fine follow through AFTER the prior week advanced 8.1%. Give extra credit for the name being both above its 50 and 200 day SMAs currently, not a feat many in the group can boast of. Still 18% off most recent 52 week highs, giving name some room to run for those that think they missed the move. Stay long with CLOSES above the flatlining 200 day SMA. 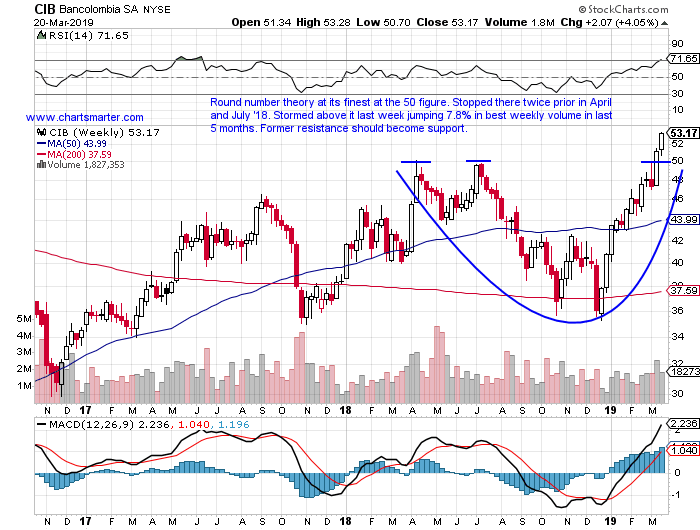 Let us now take a look at a financial play CIB on its WEEKLY chart. Blistering strength higher by 40% YTD and sports dividend yield of 2.5%. EIGHT session winning streak, and trading right at ALL time highs very impressive in a weak over financial space. Looking to break above 51.48 WEEKLY cup base trigger this week in pattern 11 months long. Former resistance at very round 50 number should become support. Enter on pullback near 52 and use a stop of 48. Let us take a quick peek just how firm CIB has been on this ratio chart in contrast to the XLF. In addition on a much shorter term time frame the last 2 sessions have seen nasty CLOSES at the lows for the daily range on the XLF, while CIB did just the opposite. A tell. If you liked what you read take a 2 week FREE trial at www.chartsmarter.com.